I always carry with me a book I call my ‘Inspiration Book’. This is the place where I jot down ideas, or flavors, so when I get back to my home kitchen I remember what it was, exactly, that inspired me. This little book has served me well, and it is directly responsible for this soup. When my husband and I were off at IFBC last month we took a little side trip into Vancouver, BC. I had never been to Canada and it was beautiful there. 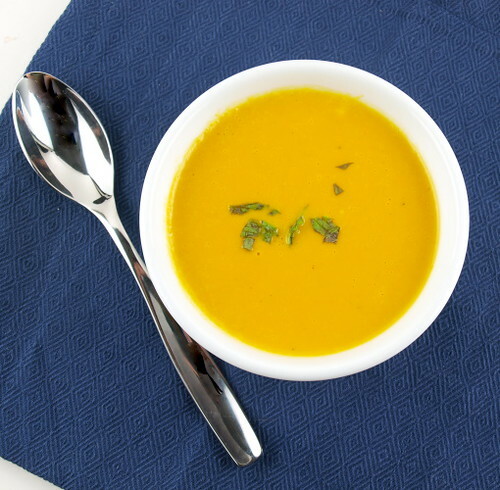 One night at dinner I had a carrot soup that was flavored with cardamom, honey and coconut. I scribbled down the flavors in my book with a promise I would make something similar at home. 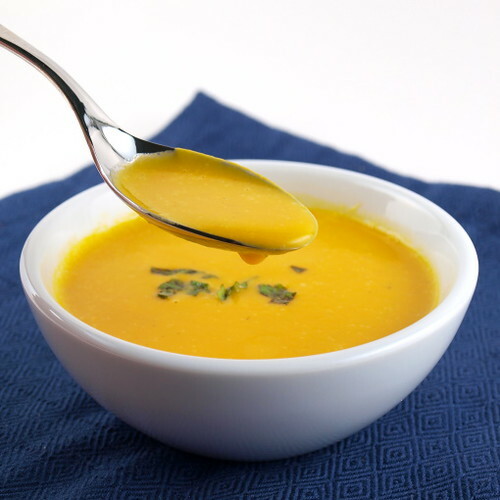 I loved the base flavors of the soup, but there were a few things I wanted to change. First, the soup in Vancouver was pretty thin. When I started the soup I only added a couple of cups of vegetable broth and let it thicken, adding more until it was thick enough to lightly coat a spoon. Once blended it was nice and velvety. 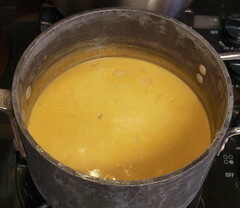 Second, that soup had WAY too much honey in it, making it almost candy sweet. I ended up adding 1/4 cup of honey. A little sweetness is lovely, but I was careful not to take it too far. I added a tablespoon of honey at a time until I got it were I wanted it. 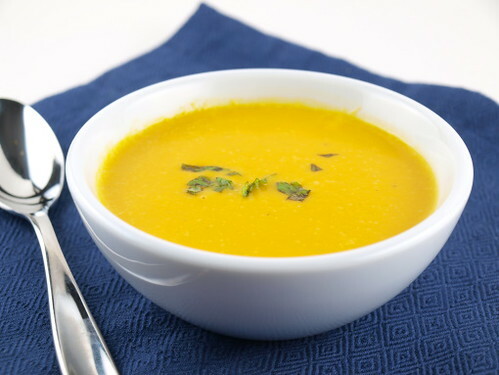 This is a great soup to enjoy with a grilled ham and cheese sandwich on a chilly evening. 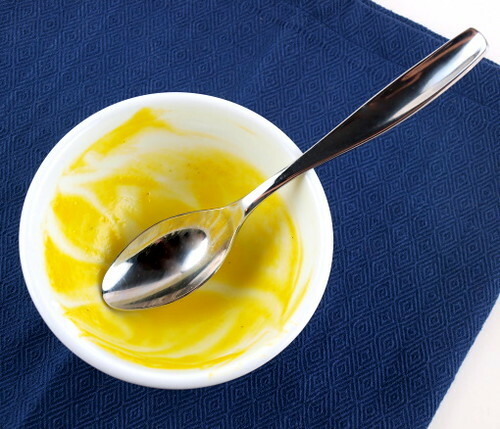 In a large pot heat the butter over medium heat until it foams. 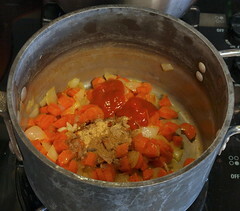 Add the carrots and onions and cook until they start to soften, about ten minutes. Add the garlic, ginger, cardamom, cumin, chili sauce, salt, and pepper. Cook until the spices are fragrant, about five minutes. Add the flour and cook until no dry flour remains, about three minutes. Slowly, stirring constantly, pour in the vegetable broth. 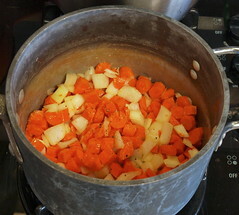 Bring the soup to a boil, then reduce to a simmer, partially cover, and cook for 20 minutes. Once reduced puree the mixture in the blender until very smooth. 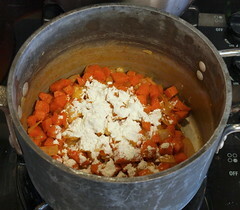 Pour back into the cooking pot and add the coconut milk, honey and lime juice. Simmer, uncovered, for ten minutes or until the soup reaches your desired thickness. Serve with fresh chopped mint.